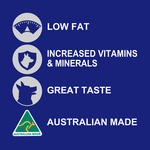 This super premium, Australian made, dry dog food is complete and balanced, with fewer calories to support the health and wellbeing of your less active or obesity prone adult dog. It contains beneficial nutrients including antioxidants to help strengthen the immune system, zinc and linoleic acid for healthy skin and a shiny coat, as well as prebiotic fibres to promote healthy bacteria in the gut for better digestive health and smaller, firmer stools. 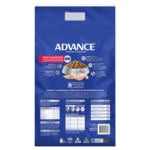 Advance Adult Dog Weight Control contains controlled levels of minerals and is highly digestible to help reduce the risk of lower urinary tract disease, it is also specifically designed to help reduce dental tartar formation for better oral health. Rice, Soy Protein Concentrate, Chicken, Maize Gluten, Natural Flavour (Chicken), Maize, Beet Pulp, Dicalcium Phosphate, Chicken Fat, Sunflower Oil, Iodised Salt, Inulin, Potassium Chloride, Taurine, Choline Chloride, Plant Extracts (Tomato Powder, Marigold Meal), Turkey, Vitamin E, Zinc Sulphate, Vitamin C, Citric Acid, Calcium Carbonate, Beta-Carotene, Antioxidants, Iron Sulphate, Copper Sulphate, Vitamin B5, Vitamin A, Potassium Iodide, Vitamin B2, Vitamin B12, Selenium, Vitamin B1, Vitamin B3, Vitamin D3, Vitamin B6, Vitamin B9. 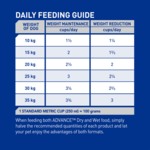 Our Italian Greyhounds Are now seniors and prone to teeth decay and stomach upsets they really love their food-and like Advance dry food-they always prefer the Chicken flavour, so the Chicken Advance weight management dry food suits all their needs. 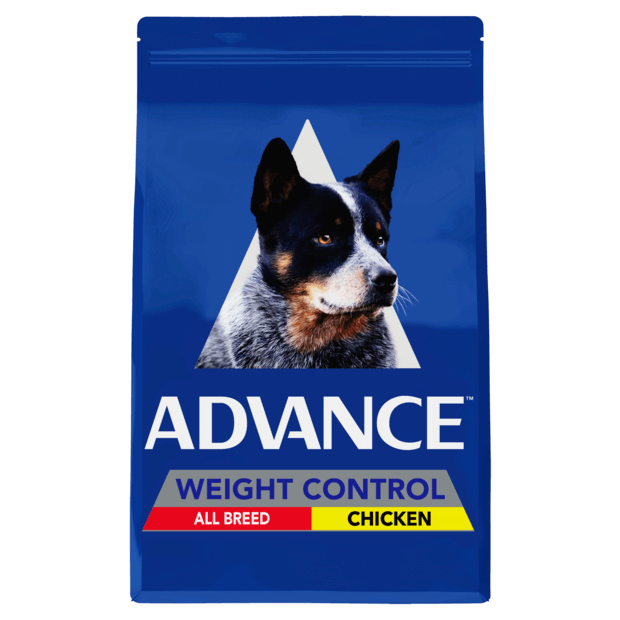 The only weight control brand that my girls eat and enjoy ! 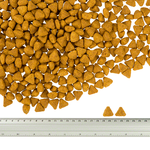 Let’s you feed them a good amount, without feeling guilty. Coats are still shiny and beautiful. 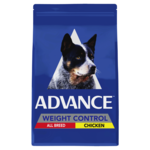 This is by far the best food for my working dogs , they both love it and keeps them in tip top shape. My dog doesn't like it at all. She won't have it sometime until the next day and when she has it her fart stinks, which has never happened before when she was having other kinds of dog food.